A dental implant is comprised of three parts, the first being the implant itself, which will be placed into your jawbone during a surgical procedure. Because the implant is made of biocompatible titanium, it will naturally integrate with your bone over time during a process called osseointegration, which creates a firm foundation for your new tooth. It will take a period of 3 to 6 months for the implant to completely heal and integrate with your jawbone. When your implant is ready, your crown, or new tooth will be attached with an abutment. Your implant crowns is made of high quality and durable ceramic porcelain. This material can be customized to match your existing teeth so your new tooth blends flawlessly with your smile. Your new crown will also provide all of the function you had with your natural tooth, so you’ll be eating and chewing with ease again. Besides the natural look and feel that dental implants provide, they also offer numerous other benefits for patients. Implants are one of the most successful and reliable treatments, offering a 95% success rate. Dental implants also protect your oral health since they do replace both your root and tooth. The loss of a root impacts your jawbone and it begins to deteriorate. The implant keeps your bone stimulated as a natural root would. Your new tooth also keeps neighboring teeth from tilting or shifting, which causes bite misalignment. Implants are also capable of replacing multiple teeth by supporting dental prosthetics such as a denture or bridge. 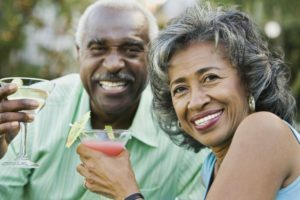 Implants offer denture wearers a more secure fit, while also promoting longevity by keeping the bone healthy. One of the best benefits dental implants offer is longevity. Because an implant is essentially becoming part of your dental anatomy through the osseointegration process, it can potentially last for a lifetime with the right home care routine and regular checkups with your dentist. If you would like to learn more about dental implants and if they are right for your needs, please contact your dentist to schedule a consultation today. Boyles General Dentistry & Implant Center located in Midland, TX, combines the talents of 3 seasoned dentists to bring you nearly 80 years of dental expertise. We offer comprehensive implant dentistry, which means that we can complete your implant from start to finish in the comfort of your Midland office. If you would like to contact Boyles General Dentistry & Implant Center, we can be reached by calling 432-685-7011 or through our website.